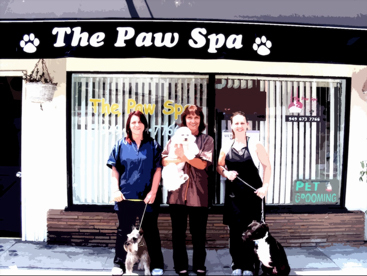 The Paw Spa was born in 2002 in Newport Beach, headed by Debbie Pratto who wanted to improve the grooming services in the area after moving from San Diego. The Paw Spa prides itself on delivering quality pet styling, giving personalized attention to each individual owner and pet. All employees are well trained in animal care and we take an interest in the overall health of your four-legged baby. With regular grooming that requires us to see every inch of your dog's body, we are usually the first to notice if something unusual is present with your pet's health. Everyone at The Paw Spa is highly experienced and knowledgeable and are happy to give advice on your specific breed and answer questions you might have regarding its care. We work closely with Dr. Earl at Lido Animal Hospital in Newport Beach for advice when we suspect a health issue is present so we can alert you before your pet is compromised. We partner with Pup Rescue to provide grooming to the local shelter dogs so they have a better chance at being adopted. We want every dog to have a good home and proper care, and that's why we always suggest you spay/neuter your dog to prevent more unwanted pets ending up in the shelters or worse, euthanized. We are more than a quality pet spa for your pet's new makeover, we care about our work, your pet's health and how we can keep your pet happy, healthy and safe. Surrounded by sunny beaches, we have a newly remodeled facility to help pamper your most precious companion. Come on in to meet our pet stylists and give your pet the ultimate pampering experience!